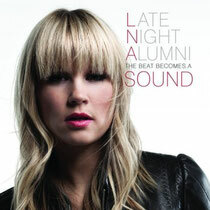 Late Night Alumni are back with their fourth album, ‘The Beat Becomes A Sound’, which is released on Tuesday January 29 on Ultra Music. The album is a heady electronic journey, returning listeners to Late Night Alumni’s singular down-tempo mix of ethereal vocals, jazzy drum breaks and organic instrumentation, where the inimitable vocal lead of Becky Williams again provides the lovely unifying thread. The Utah based four piece released their debut album in 2005, and despite no label support, ‘Empty Streets’ soon became a cult-classic, emerging as a defining after-hours soundtrack and laying the blue-print for Late Night Alumni’s signature blend of breathy vocals, house beats, lush strings and delicate melodies. Fans of Grammy nominated DJ/producer Kaskade will be aware the DJ is a founding member of the band and used lead vocalist Becky Williams on two tracks on his artist album ‘Dynasty’, while the entire band appeared in the much loved acoustic version of Kaskade’s track ‘4am’. Late Night Alumni’s ‘Empty Streets’ was licensed by Toyota for its IQ ad campaign and has appeared on more than a dozen of the world’s biggest dance compilations. The tracks ‘You Can Be The One’ and ‘Uncharted’ from their 2009 album ‘Of Birds, Bees, Butterflies, Etc.’ were featured in the Steve Carell and Ryan Gosling movie ‘Crazy, Stupid Love’. In addition to ‘The Beat Becomes A Sound,’ Ultra is releasing a 6-week video series, featuring Late Night Alumni’s Performance at the Masonic Temple in Salt Lake City, including unreleased material from the new album along with a plethora of past album hits. In anticipation for their forthcoming album, the band will head out on a three-date mini tour hitting San Francisco, Chicago and DC.